This is something for Battlefield and Dota soldiers out there: Invasion together with AMD Malaysia are cooking up a tournament specially for you guys. 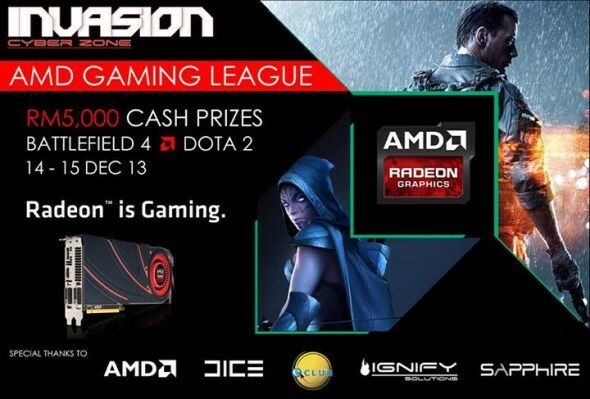 Dubbed as the Invasion – AMD Gaming League, the tournament will be held from 14 to 15 December at Invasion Cyber Zone in Taman Bukit Maluri, Kepong. There will be a total of RM 5000 cash prizes have been reserved for the winners of this tournament, with majority of the prizes will be going to the Dota 2 winners (yeah, we know). Nevertheless, it is an event that Battlefield 4 players out there might want to consider since we haven’t heard of a Battlefield tournament in Malaysia for quite some time. To all Battlefield 4 and Dota 2 teams that are interested to participate in the Invasion – AMD Gaming League, you are welcome to register your team and members right over here for free. For more info, do get in touch directly with Invasion e-Sports through their Facebook page.